A new Torah scroll is in the making. The brainchild of Temma Gentles, Holy Blossom Temple’s artist-in-residence in Toronto, the project originated from a chance encounter Gentles had with Marilynne Cass a year ago. Gentles, an award-winning Judaic textile artist, is the artistic director of Torah Stitch by Stitch (TSBS), while Cass is the project’s executive coordinator. “I fell in love with the concept and have thoroughly enjoyed seeing this dream turn into a reality,” said Cass about accepting Gentles’ invitation to join the team when the project was just beginning. Gentles came up with the idea while on sabbatical in Israel several years ago, when seeking a way to help people engage in the words of Torah. 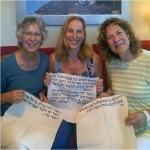 As a textile artist, she envisioned creating a cross-stitched Torah. Gentles designed a new font for Hebrew letters and divided the entire Torah into 1,463 four-verse segments for people to work on. TSBS participants range from men and women in their teens to those well into their 90s, from skilled stitchers to novices. TSBS stitchers come from many different religions – from Judaism to Christianity, Buddhism to Islam. “Even though we’re doing the Torah (the Five Books of Moses), this isn’t an exclusively Jewish project,” said Cass. While many TSBS stitchers are from the Toronto area, the project has spread throughout Canada. Rubin is helping keep track of the 700 stitchers. “I assign each stitcher a coach, so they have someone to contact if they run into trouble,” she said. “I also follow up with the stitchers who’ve had their panel for over six months and haven’t yet completed it. If someone cannot complete their panel, we try and find out why and offer help or, if need be, find a volunteer to adopt the panel. It’s important that all panels are complete, so the finished project is the entire Torah. TSBS now has nearly 900 participants in 13 countries, with more applications coming in each week. “Our ultimate goal is to have all 1,463 panels completed,” said Cass. “We’re more than halfway there.” The books of Genesis and Exodus have been finished, and stitchers are now working on Leviticus. The project’s registration form, more information and helpful tips are available at torahstitchbystitch.temmagentles.com.